ePageCreator is a program that allows you to make online brochure that is viewable on multiple devices from PC and Mac to mobile devices like smartphones and tablets. No technical knowledge is need to create a online brochure. In order for the flipbooks to work on all of these devices ePageCreator outputs the flipbooks in Flash and HTML5. Flash for computer and HTML5 for mobile devices. 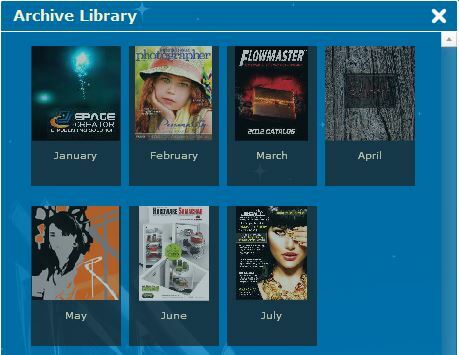 There is also a option to make ePub and mobi for eReaders. 100% white label. Use your own company logo and branding Getting Started. This will allow the reader to click and view realted issues that you want them to read. A great way to keep multiple publications oraganized. Allows readers the opportunity to catch on any publications that they missed. Share your publication with friends and family using ePageCreator's built in sharing features. You can share you flipbook using the share via email feture that sends a email to your friend with a link and a message about the flipbook. Share via Social media will allow you to post a link to the flipbook onto the social media platform of your choice.